I know we more cultured comic book enthusiasts generally roll our eyes in highfalutin disinterest when the subject of Wizard magazine comes up, but for a time (pre-widespread Internet, natch) it really was the place to get most of your comics news. Wizard, for me was the thing I'd grab if somehow at the end of the month I still had a five-dollar bill burning a hole in my pocket. It was something of a luxury purchase, and perhaps because of that poor young impressionable comics enthusiasts put a bit more stock into Wizard's recommendations than they otherwise would. Sometimes their suggestions would be a bust, as illustrated by the ubiquity of early nineties Image Comics currently clogging quarter-bins nationwide... other times, their recommendations would be great. Wizard was the first place I'd ever seen mention of Strikeforce: Morituri, and Quantum & Woody, after all. Those two series remain favorites of mine to this day. Another book they had given a bit of a push to was the one I want to discuss today... Major Bummer. 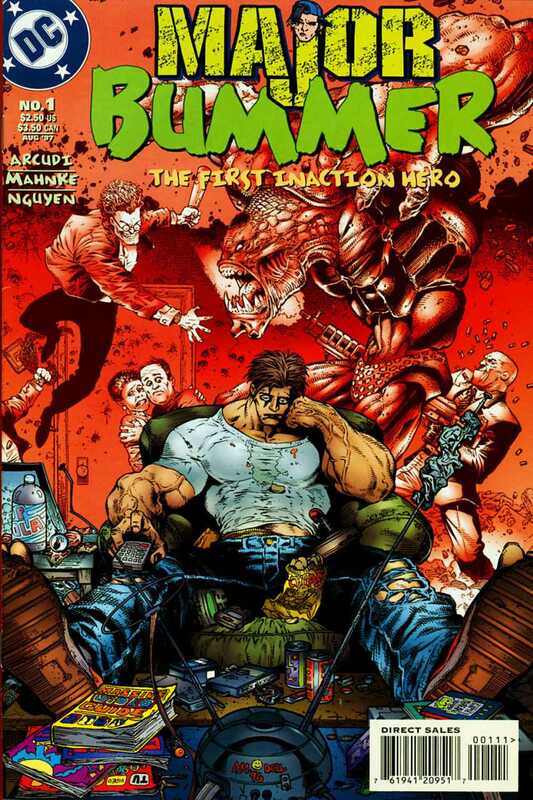 In 1997, I was 17 years old... a book about a slacker superhero should be right up my alley. Is it worth your time? Let's find out. Louis Martin is a slacker. That's really all we know about him from the get-go, he also likes video games. He receives a mysterious package which, upon opening transforms him into a musclebound technologically-gifted would-be superhero. Interestingly, this is all unknown to Lou for much of this opening issue. The next morning, he finds that he has woken up late for work at Kathie's Video Repair. We are introduced to a ramshackle street gang who is bent on procuring Corn Nuts from the local convenience store, I'm assuming there will be more on that (and them) later on. While repairing a VCR unit, Lou gets lost in thought. Before he knows it, he has re-purposed the VCR into a ray gun. His boss, Mr. Kathie arrives and fires him for his excessive tardiness. Upon seeing what Lou has become, Kathie freaks out and runs out of the shop. Slump-shouldered, Lou leaves... ray gun in tow. While walking down the sidewalk, Lou catches a glimpse of his reflection and sees what he has become. He's determined to figure it all out... after he grabs a bite to eat. We meet another odd gang, who decides to trade in a half-million dollar heist at a bank for an $83 robbery at the convenience store. They decide to rob the very convenience store where Lou is attempting to write a check in exchange for a pile of snack cakes. Lou thwarts the robbery, although the store is destroyed in the fracas. He tries to parlay saving the clerk's life into some free goodies, and is turned down. When Lou gets home he is surprised to find four curiously dressed individuals hanging out in front of his building. Now, at release I bought issue #1, which remains the only one in my possession. I have to figure that it must not have made that big of an impression on me. It's strange, as this feels as though it would have been exactly the kind of book I would have been in the market for back then. It was offbeat, and different from anything else I'd seen at the time. I'm not sure how a 17 year-old me would have lost track of this one. Upon reading it now... It's pretty good and it looks nice, however, I still have no interest in seeing how it plays out. I really don't want to say that I'm too old for this type of story, perhaps it just takes me back to a time in my life that I've outgrown (yeah, odd for a dude in his mid-thirties who still reads comics everyday to say...). I can't think of anything outright bad to say about this book, just that I'm really not interested in it. I'm absolutely sure there's an audience for it, and they will think it's great. It's quite well-written, and the art is wonderful. A bit of a product of its time, perhaps... but, still certainly to be enjoyed. This came from what I consider to be an odd time at DC Comics. It felt like a very experimental time, where DC was producing creator-owned books (such as this) which could be folded into DC canon (like say, Young Heroes in Love). I may be mis-remembering my dates here, but it felt as though there were a lot of new more experimental #1's around this time. Titles like Chronos, Chase, Resurrection Man and Scare Tactics feel as though they are part of this vintage. Very strange and interesting era for DC. This is one title that I have not come across "in the wild". I can honestly say I've never seen it in the bins. If you were interested in checking it out, it isn't terribly expensive at Mile High Comics. If you want the entire 15-issue story collected, The Complete Major Bummer Super Slacktacular was released as a trade in 2011, from Dark Horse Comics. Instocktrades currently has it (at 42% off cover price to boot). It is also available digitally. It's hard to remember a time when it seemed like every movie had its own trading card set. These appear to be those horrendous odd-sized cards to boot. My mother once accidentally bought me a package of card-binder pages in that size. It's difficult to let such trauma go. Just a tad bit on the nose there, no?